With the objective of increasing tenancy, IA Design worked with Credit Suisse to design a flexible, functional and engaging workspace that promoted the tenancy of 45 St Georges Terrace. The brief was to brighten up the space and create a neutral yet dynamic working environment that would be flexible enough for new tenants to adapt it to suit their requirements. The space was designed as an open and welcoming workplace, with facilities to house 108 staff. The space offers a feeling of spaciousness and light as soon as you enter from the lifts. The reception area and boardroom are open to the rest of the office and the breakout spaces provide a fun, informal atmosphere for staff collaboration. The space also consists of offices, workstations, meeting rooms and two large utility spaces at the north and south end of the office to facilitate the number of staff. A sophisticated palette of black, white and blonde timber was used throughout, as well as breaks of colour in the staff amenities space. 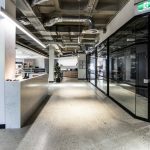 Credit Suisse were extremely happy with the success of this speculative fitout and as a result, the space was leased to a new tenant within 2 months of practical completion.